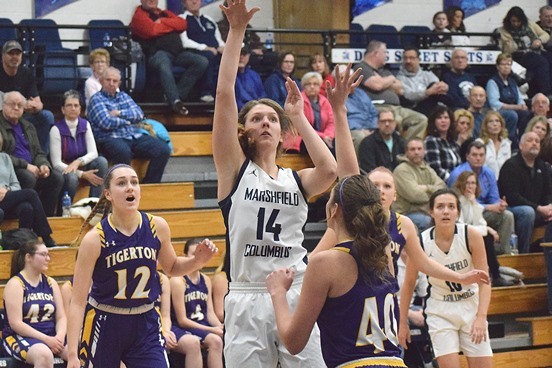 Undefeated champion Colby landed three players on the first team and another on the second team of the 2018-19 All-Cloverbelt Conference East Division Girls Basketball Team. Colby seniors Ashley Streveler and Alyssa Underwood, and junior Hailey Voelker were first-team selections for the Hornets, who finished a perfect 16-0 to win its second-straight Cloverbelt East championship. Streveler led Colby in scoring at 13.9 points per game, making 66 3-pointers and shooting 72.8 percent (59 of 81) at the free throw line. Voelker came in at 12.2 points and 6.2 rebounds per game, and Underwood chipped in 11.8 points per game and 29 3-pointers. Marshfield Columbus Catholic junior Addison Baierl was a second-team pick, and seniors Hailey Roehl and Maren Seefluth were honorable mention choices. Baierl topped the Dons in scoring at 12.4 points per game, shooting 73.3 percent from the free throw line (44 of 60), and she had 18 3-pointers. Roehl led the Dons with 41 3-pointers and averaged 10.4 points and two steals per game, while Seefluth averaged 7.4 points and 1.3 steals per game. Colby’s Vanessa Lopez also was a second team choice. She averaged 10.5 points and a team-high 6.6 rebounds per game for the Hornets, who finished 25-1 overall and reached the WIAA state tournament in Division 4. Owen-Withee senior Jennifer Wendler was named Cloverbelt East Player of the Year for the third-straight season. She averaged 23 points and 13 rebounds per game for the Blackhawks. Remi Geiger of Loyal and Sammie Cappadora of Neillsville rounded out the six-player first team. Spencer did not have a player named to the all-conference team. First team: Ashley Streveler, sr., Colby; Alyssa Underwood, sr., Colby; Hailey Voelker, jr., Colby; Remi Geiger, jr., Loyal; Sammie Cappadora, sr., Neillsville; Jennifer Wendler, sr., Owen-Withee. Second team: Vanessa Lopez, sr., Colby; Addison Baierl, jr., Marshfield Columbus Catholic; Emma Warner, jr., Gilman; Grace Grunseth, jr., Gilman; Bella Opelt, so., Neillsville; Brianna Simington, jr., Owen-Withee. Honorable mention: Alexa Underwood, so., Colby; Hailey Roehl, sr., Marshfield Columbus Catholic; Maren Seefluth, sr., Marshfield Columbus Catholic; Amanda Bogdonovich, jr., Greenwood; Brooke Hinker, sr., Greenwood; Hailey Rueth, sr., Loyal; Alli Schoengarth, jr., Neillsville; Hailey Geldernick, so., Owen-Withee. Player of the year: Jennifer Wendler, Owen-Withee.